"Missouri, Death Certificates 1910–1962", digital image, Ancestry.com, "Sackett, Belle Ross, d. 3511 Genesee St, KC, Jackson County, MO, 3 Nov 1922, res. 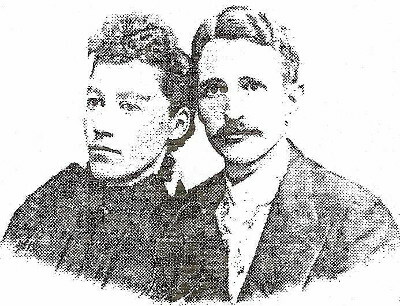 3511 Genesee St, b. Bloomington, IL, 18 May 1869, age 53-5-15, husband Filertus Sackett, father Wm W Ross b. Glasgow, Scotland, mother Sarah Jane Cunningham b. OH, informant Filertus Sackett, 3511 Genesee, cause exhaustion from carcinoma of liver and of breast, bur. Butler, MO, 4 Nov 1922." 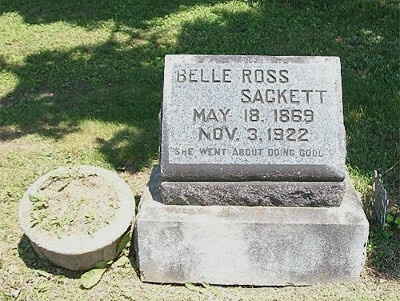 "Bates County, Missouri, Cemetery Index, 1823–1959", database, Ancestry.com, "Sacket, Belle, b. 18 May 1969, d. 3 Nov 1922, bur. 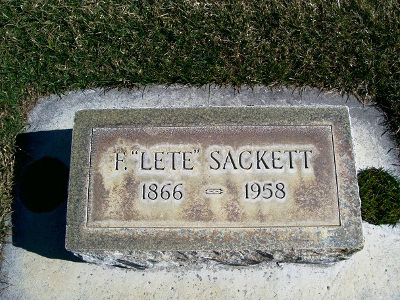 Oak Hill Cemetery, Bates County, MO, spouse Leet Sacket." Davis, Leodica, 63, at home, b. NC. William R. HEPLER, other, single, 16, b. IN, clerk in grocery store, father b. IN, mother b. IN. Sackett, Mildred, dau, b. Nov 1897, 2, b. MO, father b. MO, mother b. IL. Sackett, Marion J, dau, 9, b. MO, father b. MO, mother b. IL. "US City Directories, 1822-1995", digital image, Ancestry.com, Kansas City Directory, 1913, "Sackett Filertus trav r 3511 Genesee"; 1914, "Sackett Filertus clk Ford Motor Co r 3511 Genesee"; 1915, "Sackett Filertus mechanic Ford Motor Co r 3511 Genesee"; 1916, "Sackett Filertus L mach r 3511 Genesee"; 1917, "Sackett Filertus L assembler r 3511 Genesee"; 1918, "Sackett Filertus L mach r 3511 Genesee"; 1919, "Sackett Filertus L auto sales h 3511 Genesee." Sackett, Marion J, dau, 19, single, b. MO, father b. MO, mother b. IL. "US City Directories, 1822-1995", digital image, Ancestry.com, Kansas City Directory, 1925, "Sackett Filertus sales R P Rice Motor Co h3511 Genesee"; 1927, "Sackett Filertus h3511 Genesee."